PHUKET: -- With heavy downpours causing traffic tailbacks and minor flooding across Phuket roads this morning, the Thai Meteorological Department (TMD) has issued a “Heavy Weather Warning” covering Phuket and other provinces along the Andaman coast. 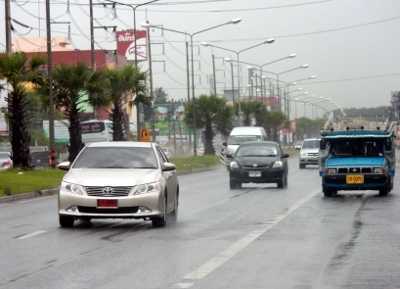 The warning urged people in the affected areas to beware of flooding and noted that the heavy weather is expected to continue to until at least Friday. Waves in the Andaman Sea were expected to reach heights of about two meters. “All ships should proceed with caution during the period,” the warning urged. 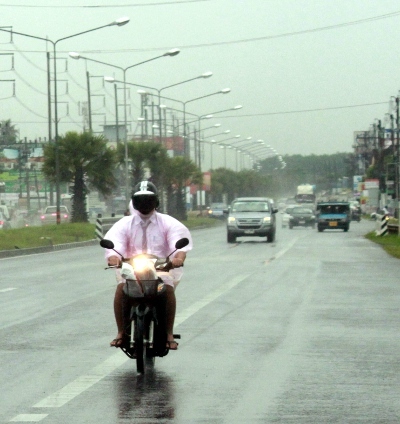 Rawai and Chalong this morning very heavy rain, road flooded up to about 30 centimeters. Went to Kata, roads were almost dry. It looked like it had rained, but with dry patches on the roads just a bit. As we all know, weather can be very localised here on Phuket. At the Central junction this morning, the water was flowing downhill like a river. Cars were really jammed up driving north, fighting against the flow of rainwater. Couldn't help but try to envisage how the proposed underpass would fare with that water.! “We sent the warning letter to every local administration yesterday, warning of possible flooding and landslides on the island,” DDPM-Phuket chief San Jantharawong told the Phuket Gazette this morning. “If they need any help from us [DDPM-Phuket] they will be able to call,” he added. The DDPM-Phuket has asked people in high-risk areas to beware of flooding thorugh to Saturday, when the heavy rains are expected to ease. The warning also cautioned all ships in the Andaman Sea to proceed with caution, as waves may reach a height of two to three meters. 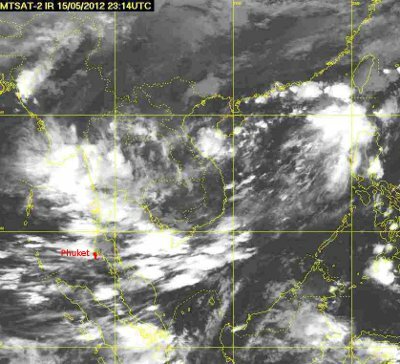 The TMD announced that the current weather conditions were due to the high air pressure from China, which covers Northeast Thailand and low air pressure areas in Central and Eastern Thailand, as well as the southwest monsoon prevailing over the Andaman Sea and the Gulf of Thailand. “If you have any information [about flooding and landslides] please report it to the DDPM-Phuket at 076-218444,” said Director San.“We have officers standing by every hour of every day,” he said.